Suzanne Rheinstein is a self proclaimed champion of the limited palette. That is not to say her palettes are not interesting because they lack a cornucopia of color. Just the opposite – her rooms sing with a refined sophistication. Attention to subtle detail, proportion and texture are evident in all her designs and result in spaces that have “the graciousness of an earlier era but not the formality and folderol.” Her new book, Rooms for Living, A Style for Today with Things from the Past, outlines, in chapters organized by room, how she achieves harmonious homes for her clients, all different and individualized yet unified by themes of beauty and comfort. To elucidate the mantra of the limited palette, this elegant living room shows how varying shades of the “Creamsicle” color on the banquettes are employed throughout the room lending a warm and flattering glow. The chapter on dining rooms (and breakfast rooms) includes a wide range of projects and styles showing Rheinstein’s stylish sensitivity to how her clients live. This tonal kitchen is all about the light. A pared down palette and simplified architectural elements let the details shine. A simplified fire surround is enhanced by a collection of 18th century Delft plates which thematically coordinates with the Hollyhock Italian Wing Chairs covered in Suzanne’s Delft Pom Pebble for Lee Jofa. 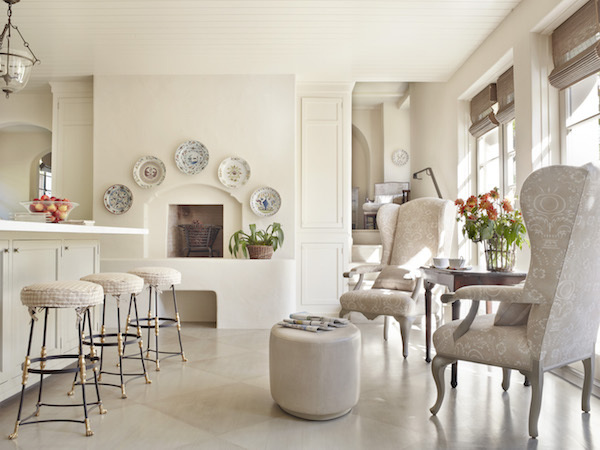 A pale painted floor sets the tone echoed in the charming quilted slipcovers on fabulous French-style stools whose distinctive brass details lend just the right amount of glamour to an otherwise quiet understated room. 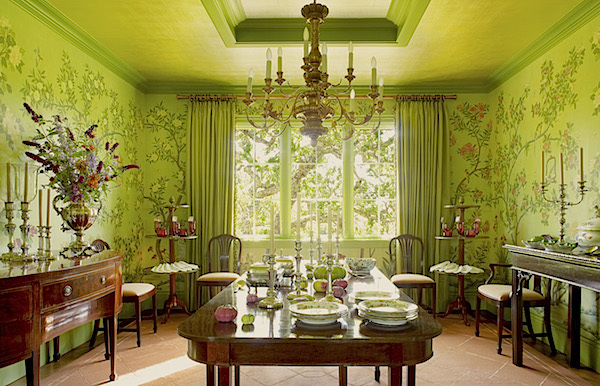 At the other end of the spectrum is this ebullient chinoiserie dining room where the lively green palette reflects the owners’ love of entertaining and their extensive collection of hand painted porcelain. At the other end of the room is a wonderful set of mirrored fretwork doors concealing the dishware. The chapter on personal retreats includes a sitting room which is next to the room above. Called “The Nest” by the family, it was designed for a woman whose many interests include a love of gardening. The intense chartreuse of the dining segues into a soothing escape of green and aqua with hand painted bamboo trellising. The sense of the garden is contined indoors with deep wicker seating, low bookshelves of horticulture books, potted foxgloves and a series of beautiful Vladimir Kanevsky porcelain flowers on wall brackets (see our video visit to Vladimir’s amazing studio) which Suzanne carries in her exquisite Los Angeles shop, Hollyhock. I hope you can get a sense of this marvelous guest room that is a large double page spread in the book. With an unusual layout and generous sense of scale and proportion, it is a room replete with beautiful features and details. With hand printed cotton bed hangings, an oversized statement piece of art by Christian Brechneff (whose work we also saw in Bunny Williams Home’s new showroom) and room to write, read and relax, I’m not sure guests find much reason to leave. As a designer based in Southern California, Rheinstein has included a chapter on Outdoor Rooms. As she says in the opening lines, “Not everyone is passionate about working in a garden, but most cannot resist the allure of living in a garden.” As the interest in indoor/outdoor living continues to be on the rise, these spaces are becoming more a part of homes’ design vocabulary. At one end of a large pergola, below, is assembled an understated collection of furnishings. Cane chairs painted a beautiful soft green surround an iron table topped with antique tiles from Spain. Beyond, a spout drips water into an old stone trough and Moroccan lanterns hang from weathered beams. It’s the type of chic transportive space that makes you feel you could be anywhere from Los Angeles to Tangier. From entrance halls to powder rooms, Rheinstein offers inspiration and advice on how to live with beauty and comfort throughout your home. This entry posted in books, interior design. 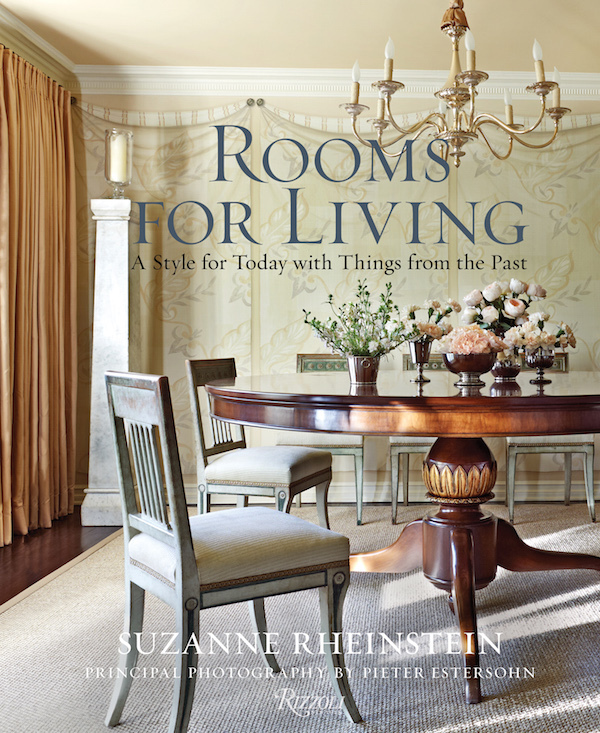 Entry Tags: Design Books, interior design, Suzanne Rheinstein Bookmark the permalink. This and the Bunny Williams piece… just my cuppa. Thank you for an beautiful and inspiring start to the week. at the same time. 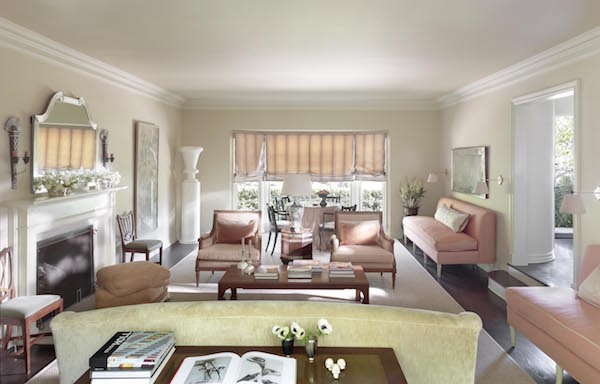 Suzanne creates rooms that have a history. OMG—I need that lattice bamboo room! I am inspired to add a little of this to my new office/sun room. Suzanne has written another exquisite book! Thank you for this exquisite post!! What a gorgeous book – can’t wait to add this one to my collection!! 80 queries in 0.579 seconds.